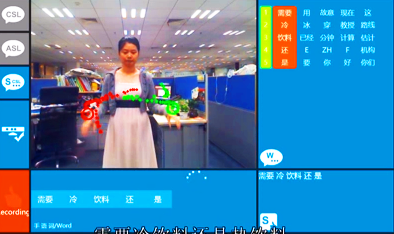 A video uploaded this week to YouTube by Microsoft Research Asia–via the Institute of Computing Technology at the Chinese Academy of Sciences Beijing Union University, shows (1) visual recognition of sign language and (2) communication via an avatar. A menu on the side shows icons for “ASL” and “CSL”, to which I’ll infer these are for American Sign Language and Chinese Sign Language. Pretty amazing technology– See below.